Gundulic Square, locally called Gundulićeva Poljana is a busy Dubrovnik’s square which is also the home of popular morning fruit and vegetable market. It is located at the southern side of the Stradun, right behind Dubrovnik’s Cathedral, bordered by elegan buildings and numerous shops and restaurants. 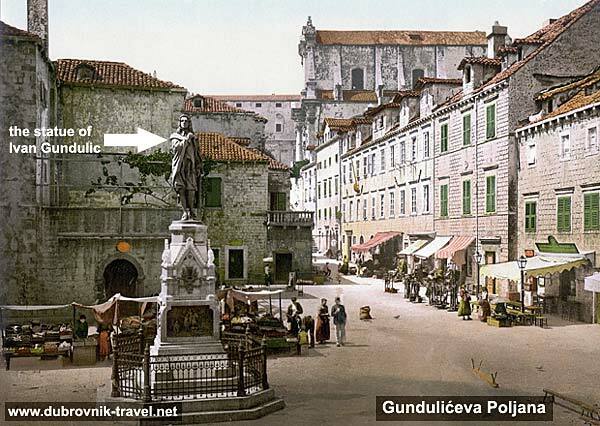 The square is dominated by the monument of Dubrovnik’s well known 18th century poet, Ivan Gundulić, sculptured by Ivan Rendić at the end of 19th century. On the monument’s pedestal there are some bronze reliefs depicting the scenes from Osman – the Gundulic’s famous poem. Gundulic Square also serves as an attractive atmospheric venue during the Dubrovnik Summer Festival (Dubrovačke Ljetne Igre) as well as for various other concerts, performances and gatherings. In the mornings, the square is very busy with shoppers while in the afternoon and evenings it is often almost deserted. See also Gundulic’s Square location on map of Old Town + some images of the square and my post when I visited the square in the early morning.